You won’t get far in photography without a tripod. Sure, you can take all sorts of photos handheld. But if you want to take night shots, time lapses, wildlife shots with long telephotos, carefully crafted still lifes, long-exposure landscapes and more, you need the support of a decent tripod. However, choosing the best tripod for your camera can be tricky: the options vary considerably in size, price and features. That's why we've put together this buying guide – here, you'll find our pick of the top tripods available right now, for a range of different types of photography. So how do you decide which tripod is best for your DSLR? Well, one thing you’ll quickly find is that a cheap tripod can be a false economy. But aside from price, there are a number of other considerations to make before purchasing a support, from sturdiness to speed of set up, portability and more. You’ll find a detailed run through of all the aspects to consider at the bottom of this buying guide. Our best advice, though, is to invest in the sturdiest tripod you’re prepared to carry, and to consider the type of photography you do. Outdoor photographers, for example, may benefit from an element-resistant, four-section tripod that folds down into a smaller space. Pro and enthusiast photographers would be wise to invest in a customisable modular tripod system, while beginners might prefer a cheaper non-customisable option with a simple three-way pan-and-tilt head. How much will a decent tripod set you back? Tripod kits that comprise a set of legs and a head can range in price from around $15/£10 for a flimsy, often unbranded option, to about $1,500/£1,250 for a top-of-the-range option. With an eye on stability, load-bearing capacity, features and performance, we’ve selected eight sturdy – yet sensibly priced – tripods here that we think are the best you can buy right now. They all cost around the $300/£200 mark, but there are some fundamental differences in design to suit different users. And they all weigh between 1.4kg and 2.6kg, so they’re lightweight enough to be easily carried. Each comes with a ball head, apart from the Benro Mach3, which bucks the trend with a three-way head. They also all have a maximum load rating of at least 5kg; some are rated at twice that or even more. The Kenro Karoo Ultimate Travel Tripod is a versatile model. It comes with the now-favoured design of swing-up legs for a reduced folded height of just 48cm, yet achieves a towering maximum operating height of 190cm, literally standing head and shoulders above most ‘travel’ tripods. This is mostly thanks to a novel extending centre column design. The four-section legs have identical diameters to those of the Benro tripods, and one leg can be detached for use as a monopod. An important additional trick, matched only by the Manfrotto tripods on test here, is that the centre column has a 90-degree pivot facility – ideal for ultra-wide-angle, macro and very low-level shooting. If you prefer to use a short centre column for ground-level shooting, one is provided as well. Instead of removable feet, retractable metal spikes are fitted within screw-action rubber pads. Minimal turning is required to release and lock the main leg section clamps, and operation of the multi-angle leg facility is quick and easy. Rigidity is very good at all heights, when using the centre column in either vertical or horizontal modes. The aluminium kit (KENTR401) offers stand-out value, while the carbon version (KENTR401C) is also well-priced at $306/£218, but is only 10 per cent lighter. For innovative design and all-round usefulness, the Kenro Karoo Ultimate Travel Tripod is hard to beat, at any price. Manfrotto’s highly popular 190-series tripods are now split into 190 and ‘190go!’ categories. The latter uses twist locks for the leg sections, whereas the current 190 tripod range has redesigned Quick Power Lock levers. Choices include three-section and four-section aluminium legs, with XPro heads of either 3-way or ball design; while Carbon fibre alternatives are only available for the 190Go! series. In this price bracket, the four-section Manfrotto 190XPro4 ball head kit (MK190XPro4-BHQ2) is our top choice. It’s a full-sized tripod that reaches a lofty operating height of 175cm, yet shrinks to a fairly modest folded height of 57cm. That’s despite the tripod lacking swing-up legs. In this latest version, the 90-degree pivot facility is quicker and easier to operate, enabling you to swap to horizontal boom mode in just a few seconds. The four-way, multi-angle leg lock system is also improved, and the new locking levers for the leg sections have an innovative design that enables you to push one side of the lever or pull the other to release them. The tripod legs remain rigid and sturdy even at their maximum operating height, with the centre column fully extended (and the four-section legs help to reduce the carrying size). The real star of the show, however, is the XPro ball head. It’s absolutely rock-solid, comes complete with an adjustable friction damper and pan only release. The Manfrotto 190XPro4 ball head kit is pricey – and omits extras like metal spikes for the feet. But overall, it’s the best head in the group, and the legs are pretty good too. We’ve been taken with the quality, performance and affordability of Novo carbon-fibre tripods in the past. The Novo Explora T5 undercuts the T10 for price, weight and load capacity, and it’s a little shorter as well. It’s actually the lightest kit in this group, at just 1.43kg, but still has a very decent maximum load rating of 10kg for both legs and head. With four sections per leg, it doesn’t fold down particularly small, at 47cm, but manages a maximum operating height of 161cm. The carbon legs are also resistant to flexing and vibration, even when fully extended and utilising the bottom sections that only have a 14mm diameter. Simple but effective, the ball head boasts quite a unique design. There’s the often-seen adjustable friction damper, but it’s built into the main release knob. And there are not one but two pan-only release knobs: one that enables rotation of the entire head; the other allowing only the camera platform to rotate. A bubble level is featured as well, but you can only see it after removing the Arca-Swiss compatible quick-release plate. The Explora T5 isn't the tallest tripod in this group – and it doesn’t fold down the smallest – but it offers a good compromise in a particularly light yet nicely engineered package. The pull-off rubber foot pads that reveal metal spikes are a nice touch, and everything about the design works simply and efficiently. The look and feel of carbon fibre also adds a touch of luxury at the price. Build quality and performance are impressive for a relatively inexpensive carbon tripod kit, making the Novo Explora T5 one of the best tripods around. The Benro Travel Angel kit (FTA28AB1) uses a shorter configuration of four-section legs, compared with the Benro Mach3 tripod (at number six in this list), and they’re connected to different joints at the top. You still get three lockable leg angles, but the joints enable the legs to swing upwards, so that the feet surround the head for stowage. The overall effect is that the folded height is reduced from 60cm to just 45cm, and the Travel Angel kit is also 230g lighter, at 2.19kg. However, the maximum operating height is also 6cm shorter, although still respectable at 161cm. As with the Mach3 kit, this Benro tripod is precision-engineered and beautifully turned out, combining aluminium leg sections with magnesium castings. Again, one of the legs is detachable for use as a monopod, combined with the removable centre column. This kit adds a screw-on wooden knob, so you can use the detached leg as a walking pole. High-quality accessories include a short alternative centre column, interchangeable rubber pads and metal spikes for the feet, and a smart padded soft case. The ball head for this Benro kit is an upmarket B1 model with independent locking, friction adjustment and pan release knobs. There’s an upgrade in load capacity to 10kg and 14kg for the legs and head respectively, compared with the Mach3’s 8kg for both components. Even so, when mounted with a heavy DSLR and long telephoto lens, both the Benro tripods feel sturdy. There’s little to choose between them, but with its modern style, the Travel Angel retains the Mach3’s benefits in a compact build. The GlobeTrotter is the biggest and most heavy-duty in MeFoto’s ‘Classic’ range of tripods. It’s available in a range of bright colours (or black), and there’s also a carbon option that sheds 400g. The aluminium kit tips the scales at a moderate 2.1kg, yet has the largest overall load rating in the group, at 12kg. The tripod folds down to just 41cm, making it the second-smallest in the group. That’s thanks to the combination of five-section legs, which swing upwards for stowage. But despite the thinnest leg sections having a diameter of just 15mm, the tripod remains rigid even at its full height of 165cm, and feels worthy of its hefty load rating. One of the legs can be removed and used in conjunction with the centre column as a monopod. There are only two lockable leg angles instead of the usual three, but it’s still a worthwhile feature. There’s neither a pivot function nor a secondary short centre column supplied with the tripod. But on the plus side, you do get a set of interchangeable metal spikes and rubber pads, along with a high-quality padded soft case. The nicely engineered ball head has independent friction control and a pan-only release. It’s almost identical to the impressive Benro B1 head in looks and performance. Meanwhile, twist-action leg section clamps are quick to release and tighten – which is just as well, because there are 12 of them in total. Overall, the GlobeTrotter is a smart buy for anyone who wants a ‘full-sized’ tripod that packs away really small. Benro has designed some increasingly innovative, exotic and diverse tripods over recent years – but this isn’t one of them. The idea behind the Mach3 is to keep things simple, combining a conventional feature set with high-grade materials. As such, the legs don’t swing up for compact storage, which is a fundamental difference from the Benro Travel Angel (number four in this list). And this TMA28AHD2A kit comes with a 3-way head, but a TMA28AB2 kit is also available, with Benro’s B2 ball head. Although very traditional, the Mach3 isn’t entirely devoid of clever tricks. One of the legs can be unscrewed and used with the centre column as a monopod – however, the three-way head doesn’t really suit a monopod. Extras include rubber pads and metal spikes for the feet. As with heads in all but the Manfrotto kits in this list, the Benro comes with an Arca-Swiss compatible quick-release plate. It’s a generously long one, providing a particularly good platform for both camera bodies and the mounting feet of big telephoto lenses. Thanks to having four rather than three leg sections, the Mach3 folds down to a reasonably compact 60cm. The triple-angle facility for the legs is easy to operate, and a secondary short centre column enables low-level shooting. Stability is very good, even at the maximum operating height, and accurate levelling is made possible by a bubble level on the tripod legs and three spirit levels on the head. Throw in solid build quality, and the Mach3 is a good choice for a conventional photo tripod. When it comes to folding down small for compact carriage, the Sirui NT-1005X reigns supreme. It’s definitely designed to be as small as possible, not only featuring five-section legs with a swing-up facility, but also incorporating a two-section extending centre column. The result is a generally adequate maximum operating height of 150cm, and a particularly tiny folded height of 36cm. That’s only about half the folded height of the Manfrotto 290 kit. And despite its aluminium build, the Sirui is only 10g heavier than the Novo carbon kit. Build quality is very good: the Sirui feels solid and robust, despite its lightweight construction. It remains rigid and steady even at the maximum operating height, with all five leg sections fully extended and both sections of the centre column at full reach. Three locking leg angles are available, and there’s the usual facility to remove one leg and the centre column for use as a monopod. And there are no retractable or interchangeable metal spikes for the feet, but the rubber pads are of good quality. Set-up on the NT-1005X/E-10 is quick and easy, from the non-slip feet to the ball head with its Arca-Swiss compatible quick-release plate. All adjustments are smooth but lock solidly – although the head lacks an independent friction damper – and the swing-up legs can be locked at three alternative angles. Maximum operating height is a little meagre, but the carrying size is incredibly small. If ultra-compact carriage is high on your priority list, the Sirui is a very desirable tripod indeed. With a taller folded height than the other tripods here, the Manfrotto 290 Dual has three-section legs instead of four, and omits a swing-up design to reduce the carrying size. The latter is also true of the four-section 190 kit, but the 290’s folded height is 12cm greater. It’s not all bad news: the flip-side, so to speak, is that there are only six flip locks to operate in total, rather than the nine locks of a four-section tripod, or 12 locks for a set of five-section legs. You can, therefore, set the height of the tripod with little fuss. Like the other Manfrotto listed here (at number two), this one has a 90-degree pivot facility that's incredibly quick and easy to operate, and the push-locks for the four-way leg angle mechanism are similarly simple and effective. The leg section diameters are the same as for the three upper sections of the Manfrotto four-section 190 tripod. The bottom section is chunkier, with a diameter of 19mm compared with the 190’s 16mm. Even so, the 290 kit’s load ratings are reduced to 5kg and 6kg for the legs and head respectively, compared with 7kg and 10kg for the 190. Despite its lower load rating, the 290 tripod’s legs feel as impressively robust and rigid as those of the 190. And while the 496RC2 head lacks a pan-only release or bubble levels for levelling, it’s supremely quick for making the full range of adjustments, and feels really solid when locked. The tripods controls are simple too. Overall, the 290 kit delivers very good performance for the price. The kit is quick and easy to set up and adjust, but the folded height is comparatively tall. 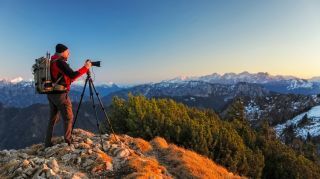 When it comes to choosing the right tripod for your camera, photography style and skill level, there are a few key considerations to make. Aside from sturdiness, set up speed is important – not all subjects will wait for you to set up your tripod, so if weather and wildlife are high on your list, choose quick-release grips over rubber twist leg locks. Portability is also a factor: carbon fibre tripods weigh less (but cost more), and the more leg sections you have the smaller it’ll fold (but the longer it’ll take to set up). Here's a full list of factors to think about, to help you choose the right option. These are the two most common materials used for tripod legs. Aluminium tripods are cheaper, but weigh more. They’re ideal if you want the maximum stability for your money. Carbon-fibre tripods cost more but weigh less, and absorb vibration better. They’re good if cost is less important than weight – but the price premium can be substantial. Tripod legs may have three, four or five sections. A larger number of sections means the tripod is shorter and more portable when it’s folded, but it will usually take a little longer to set up and may well not be quite as stable. These come in two main types: twist locks and flip locks. Twist locks take up less space and are generally a little quicker to use – you can often unlock all the leg sections in a single movement when you’re setting the tripod up. Flip locks are operated individually and may be bit slower. Try both types to see which you prefer. Sometimes the tripod head is included, sometimes not. You can change one head for another depending on how you like to work. Ball heads and three-way heads are the most common types. Ball heads are compact and quick to use, but not so good for small, controlled movements. Three-way heads are larger but allow precise adjustments for each axis independently. You can also find other, specialist heads. Geared heads allow you to make fine adjustments to camera angles. Gimbal heads are designed for use with long, heavy lenses – which can otherwise can unbalance a tripod. And then there are specialist heads for panoramas and video too. The weight of a tripod is important if you’re going to carry it any distance, but so is its folded length. If it’s too long to strap to your bag, and it’s unwieldy in trains or climbing over stiles, then it’s going to put you off taking it anywhere. Many so-called ‘travel’ tripods have legs that fold upwards for storage and completely enclose the head. This makes them smaller and neater when folded and easier to carry around. How high and low do you want your tripod to go? Shots aren’t always improved by shooting them at eye level (lower often works best), but it’s also about getting a comfortable working height. Check the height without the column extended, if you can. Not all tripods come with a centre column, but most do. You can extend this upwards to increase the height of the camera, although this introduces extra wobble. On some tripods, the centre column can be rotated to produce an angled boom, which is perfect for overhead shots, macro work and table-top photography. Using the centre column does reduce the stability of the tripod, however, so is best avoided with long exposures. Most tripods have legs that can be angled independently – which is particularly useful when working on sloping sites or in cramped areas. The standard leg angle will be fine for regular use, but it’s often useful to splay one or more legs outwards on uneven surfaces or to rest them on walls, say. Splaying out all three legs will allow you to shoot from a much lower angle. Rubber feet are fine on most surfaces but best on carpets and wooden floors, where you don’t want to cause damage. Metal spikes are good for soft and uneven ground. Some tripods have rubber feet, which can be screwed back to reveal spikes.